MD&A is officially integrating Human Performance Improvement (HPI) concepts into our safety program; so you might ask…what is HPI? HPI is an approach to safety improvement that integrates the lessons learned from scientific studies in human factor engineering and behavioral psychology into “system based” concepts to improve how decisions are made and to reduce the number of errors, mistakes and events. 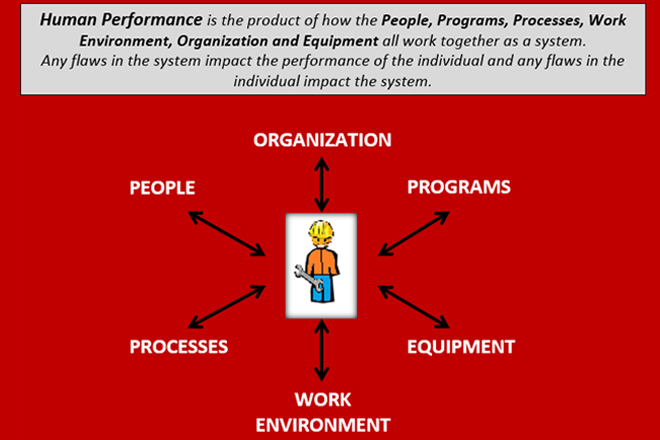 The science considers ways that the System (the people, programs, processes, organization, work environment, and equipment) can be improved to set the individual that performs work up for success and how the worker can provide feedback to improve the system. Taking human nature into account when designing processes and equipment layouts. Identifying and managing “biases” that result in poor decision making. How our conscious brain and sub-conscious brain work and how understanding this aids in reducing errors/mistakes. How to predict error rates for “this person, on this task, at this time”; by teaching them how to identify the Performance Modes we are in when we perform different tasks. How to recognize and manage common Error Traps that could set them up for failure. Choosing certain HPI tools that can be used to manage or eliminate errors and mistakes. As more MD&A employees understand Human Performance Improvement concepts and how to apply them, more employees will have the ability to participate in continuous improvement which aids in MD&A’s continued success. As our organization reduces errors and mistakes we plan to see reduced safety risk and improved quality performance and productivity. With the right perspective, safety is not an adversary to productivity, it is instead a catalyst for discussing improvement opportunities. HPI will give us this perspective. Note: Human Performance Improvement may also be known as “the New View on safety” and/or “Human and Organizational Performance” by some of MD&A’s customers. Call our EHS Director today today at (518) 399-3616 or use our Contact form.